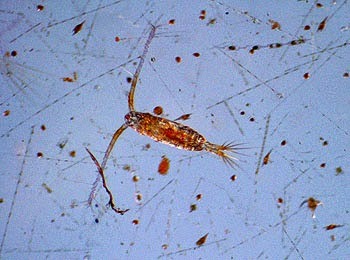 This copepod from Monterey Bay is less than one millimeter (1/32 inch) long. "Near-coastal retention of larvae affects the ecology of many marine species. In coastal upwelling ecosystems having strong offshore transport, larval ecology is greatly influenced by nearshore retention in bays and in the lee of headlands. Further, frontal dynamics along the periphery of retention zones can drive larval accumulation and transport. "